Giving any Left-of-Centre party the reins of government is like giving Dracula the keys to the blood bank. Given that this is in the Silly Moaning Herald, we can expect at least five articles over the next week, from the usual suspects, all rubbishing Tom Switzer’s piece and lashing him with predictable ad homs. Contrary to media stereotypes, many so-called sceptics – such as Abbott, John Howard, Maurice Newman and this writer – recognised that the rise in carbon dioxide as a result of the burning of fossil fuels led to moderate warming. But because we questioned the doomsday scenarios and radical, costly government-directed plans to decarbonise the economy, we were denounced as “deniers”. Thanks to Abbott’s forceful critique of Labor’s ETS/carbon tax, and the persistent failure of the carboncrats to reach legally binding global agreements, Australians have risen up against this madness. At last, there is recognition not just that there are at least two sides to every story, but that when sophisticates seek to shut down debate, it amounts to an attack on the public interest. That is why the anti-carbon zealots have become so defensive. The game is up. 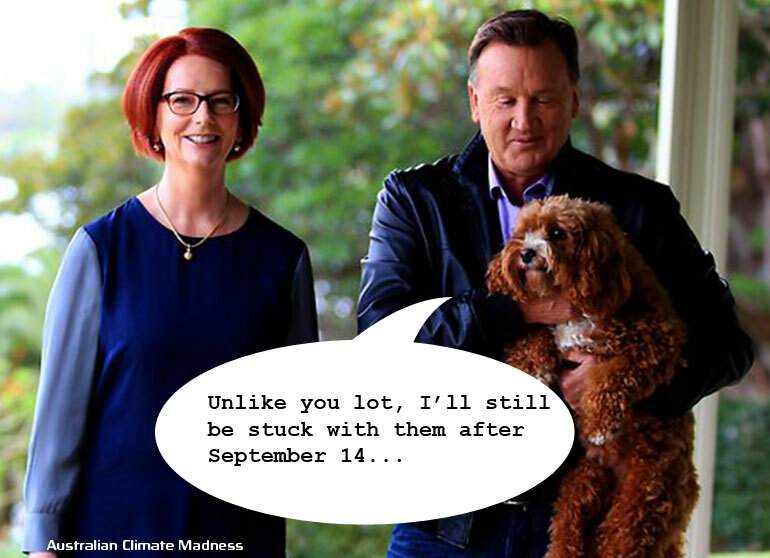 The idea of climate mitigation – carbon taxes, cap and trade, channelling taxpayer subsidies to wind and solar power – destroyed the leaderships not only of Malcolm Turnbull in 2009 and Rudd in 2010, but also of Julia Gillard and Rudd (again) last year. And although the Coalition’s approval ratings have declined since the election, polls also show that opposition to the carbon tax remains high. Last year’s Lowy Institute survey said that only 40 per cent (down from nearly 70 per cent in 2006) think climate change is serious and requires action. And yet, despite this changing (political) climate, Opposition leader Bill Shorten still opposes the repeal of the carbon tax. If Labor’s divorce from the Greens is genuine, he should support the PM’s legislation, lest he meet the same fate as his fellow deniers [sic] and become a laughing stock. Hilarious! The sub-ed’s brain, soaked with incessant green dogma, was so used to slagging off the sceptics that he subconsciously replaced “alarmists” with “deniers”. LOL, as they say. 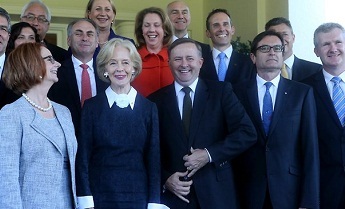 Why are you all smiling, you bunch of utter incompetents? You should be hanging your heads in abject shame. The Labor ‘government’ of Julia Gillard (in quotes because it isn’t really a government any more, it’s just a rabble) is in terminal decline after last week’s chaotic leadership non-contest. Newspoll puts Labor at 42% and the Coalition on 58% in the two party preferred, meaning Labor would be annihilated. Half of her most experienced ministers have either resigned or been sacked, leaving the PM scraping the bottom of the cockatoo cage to fill the Cabinet. Craig Emerson [shudder] has been appointed minister for just about everything, including the kitchen sink, and the other spaces have been filled by political nobodies. So one thing we can be sure of is that the ‘government’ of this country will be even worse than it was before (if that is physically possible). 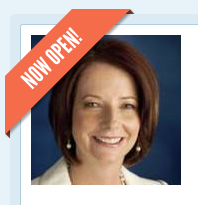 JULIA Gillard’s personal standing has crashed to a 19-month low and Tony Abbott is clearly back in front as the nation’s preferred prime minister after Labor’s “appalling” two weeks of political and policy failure. Labor’s primary vote has slumped five points to a disastrous 30 per cent after a fortnight ending with an aborted leadership spill and mass cabinet resignations, with one in two voters now siding with the Coalition. The collapse in the Labor vote has completely wiped out the party’s recovery in the second half of last year, which was built on the back of the carbon tax compensation, and has entrenched the prospect of a landslide vote against the ALP in the election scheduled for September 14. After taking into account preference flows, federal Labor’s support is eight percentage points below its level at the 2010 election, at 42 per cent – a swing that if replicated in September would remove about 30 Labor MPs and could even put Kevin Rudd’s Queensland seat of Griffith at risk. The Prime Minister said yesterday she was appalled at Labor’s “self-indulgence” during last week’s leadership bid, which was brought on after the party’s proposed media laws collapsed. She declared she wanted to show “self-belief” and that Labor’s “eyes” would be on the “Australian people”. But the latest Newspoll survey, taken exclusively for The Australian on the weekend, shows voter satisfaction with Ms Gillard down six percentage points to 26 per cent in the past two weeks. Dissatisfaction with the Prime Minister rose eight points to 65 per cent, her worst personal ratings since September 2011 when she hit a record low satisfaction level of 23 per cent. There is now more than twice the number of voters dissatisfied with the way Ms Gillard is doing her job as Prime Minister than satisfied after a steady 12-point fall in satisfaction since January and a sharper rise of 16 points in dissatisfaction during the same period. On the question of who would make the better prime minister, Ms Gillard’s support dropped seven percentage points to 35 per cent, its lowest since October 2011, while Mr Abbott’s support jumped five points to 43 per cent, his highest since September 2011. Which means, of course, that when the election comes, the disastrous policies of this bunch of losers can be reversed and Australia may, MAY I add, be able to climb out of this enormous hole it’s in. And we will almost certainly wave goodbye to the mining tax and the carbon tax. All we need is for the independents to do what they should have done months ago and put this government down. Rather than trouble themselves with the petty concerns of the lumpen proletariat, the Canberra elite carried off another spectacular day of navel gazing, as Julia Gillard once again called for a leadership ballot after a senior minister, Simon Crean, poked the hornets’ nest earlier today. One thing the Labor Party is supposed to be good at organising is a political assassination. Even their opponents assumed that. Before the Labor caucus even met on Thursday afternoon the Liberal Party had released an ad featuring the man who triggered the showdown – Simon Crean – bagging out Kevin Rudd, obviously preparing for the return of the former leader. The tag line… ”Labor, it’s a farce”. 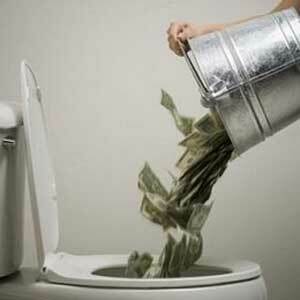 After this debacle, with an election just six months away, the Rudd ”camp” must surely be folding their tents. But the Liberals didn’t know the half of it. When the caucus met, the plotters found they didn’t even have a candidate. This wasn’t farce, it was a comedy horror show like Attack of the Killer Tomatoes. Labor’s political dysfunction had reached levels unprecedented even for a party that has spent much of the last three years tearing itself asunder. Its dysfunction was so profound it had to scramble on the floor of the House of Representatives to win crossbench support and avoid a no confidence motion – which would have precipitated an early election – all because of a leadership challenge that never happened. It had to stare down the no confidence motion against the Prime Minister in the Parliament when everyone knew it was considering an internal no confidence motion against her in the caucus room just hours later. The former leader Crean had to call for the leadership ballot before Rudd had agreed to be a candidate in order to try to sway some undecided votes because the party had been bogged in leadership dysfunction ever since the last showdown over a year ago. Reversing the normal situation where the incumbent has to be blasted out of the job, in the modern ALP people apparently have to try to blast a challenger in. This rabble would make a busload of pissed clowns look by comparison like the House of Lords. An election cannot come soon enough. Time for the cross-benchers to pull the plug – finally. “If a partner didn’t open a file for work they were doing for a client with whom they had an intimate relationship, and then had no reasonable explanation for it, that would be viewed very seriously within a law firm. “You have to have a file number, so you have to open a file so that other partners can see what work is being done. 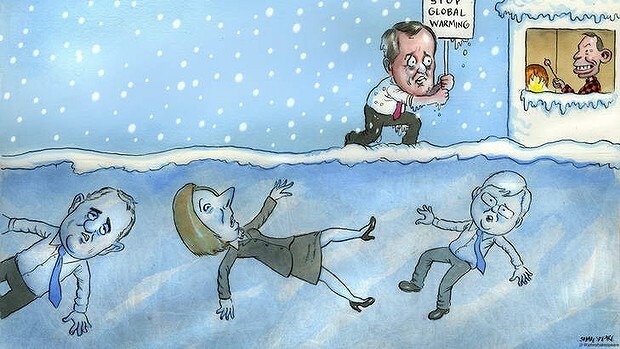 Cue Gillard’s cracked record response, no doubt: I’ve dealt with this all before and I’ve done nothing wrong. It’s wearing very, very thin, Julia. Just a reminder that when you read the following, it’s 21st century Australia we’re in, not 1970s Soviet Union. The implications for press freedom (which includes the right for blogs such as this to publish views which challenge the government position) are significant. 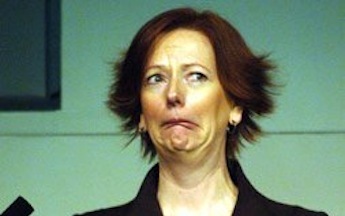 Australia’s Prime Minister Julia Gillard is floundering amidst allegations regarding her conduct as a lawyer in the mid-1990s, in particular the setting up of an association which was used – allegedly – to misappropriate union funds. The Australian and talkback hosts are on the trail, and more of the media is becoming alerted to the story, yet instead of coming clean about it and making a statement, Gillard’s first instinct, and that of her party, is to deny everything, say nothing and instead shut down the legitimate questions by “regulating” the media (i.e. suppressing dissent and only allowing acceptable views to be printed – acceptable to Labor, Gillard and the Left, of course). The mark of a true totalitarian. The hypocrisy is breathtaking. If this was a Labor opposition making the same claims of a Coalition Prime Minister, the ABC and Fairfax would be screaming from the rooftops, but naturally, because it involves their mates, Labor, both of those organisations have been virtually silent on the issue. 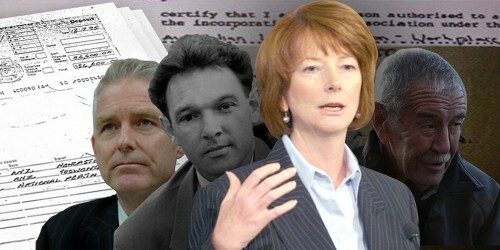 JULIA Gillard has lashed out at her online accusers over the circumstances of her departure from law firm Slater & Gordon in the mid-1990s, as her caucus colleagues urged her to “take the gloves off” in a fight with the press. The Prime Minister took aim at news coverage of her personal life and blasted internet blogs for their “gender-based” attacks on her leadership, amid increasing scrutiny of her link to a disgraced union official and her departure from Slater & Gordon in the mid-1990s. In a heated discussion within the Labor caucus, MPs urged backbencher John Murphy to “go harder” as he attacked News Limited, publisher of The Australian, over its coverage of the government. Ms Gillard responded by vowing to proceed with media reforms by the end of the year, keeping the threat of regulation hanging over the sector. The remarks came as Tony Abbott said the circumstances of Ms Gillard’s departure from Slater & Gordon were the subject of “legitimate media interest” and the Coalition would give her “every opportunity” to make a statement on the matter to parliament. PRIME Minister, you once said News Limited had hard questions to answer. When pressed, you couldn’t elaborate. Allow me to elaborate on some questions for you. Simply repeating that you have answered questions previously is a political tactic that treats voters as stupid. But we are not. You may have answered other questions long ago. But new information has raised new questions. While Ms Gillard dodges the question, Thomas has now confirmed through a second senior partner at the time, Peter Gordon, that the firm considered “terminating” Ms Gillard’s employment over her handling of the AWU matters before accepting her resignation. Mr Gordon and Mr Styant-Browne are not “birthers” – they are experienced lawyers who have been cautious and deliberate about their statements. At the heart of this matter is the allegation Ms Gillard, while a salaried partner, carried out undeclared legal work for her then boyfriend and AWU boss Bruce Wilson and his bagman, AWU official Ralph Blewitt. This included establishing an entity named the AWU Workplace Reform Association – later revealed to have received hundreds of thousands of dollars from companies that were then used by Mr Wilson and Mr Blewitt for private purposes, including buying a house in Melbourne’s Fitzroy. Ms Gillard attended the auction with Mr Wilson, who moved into the house. Mr Wilson and Mr Blewitt later sold the property, keeping the proceeds. And there’s plenty more. Rather than accept that a free press is one of the fundamental features of an open democracy, and difficult questions asked of a prime minister must be answered, the Left’s response is always to regulate and control the media, for their own selfish ends.